Change is inevitable and your training department is once again experiencing that change. A decade ago, Tom Falter joined the department and brought with him over 20 years of working knowledge in the glass & glazing industry. 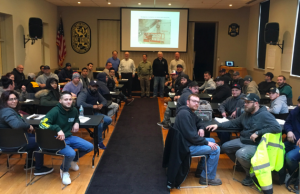 Tom changed us with his enthusiasm and passion, he pushed forward ideas and practices to make the FTI New England’s glazing program second to none. 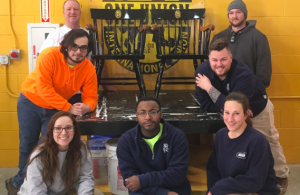 Ten years later, our glazier apprentices are more prepared for the industry we represent than ever before. Tom understood what it took to be ready to work and delivered the necessary certifications that kept them there. 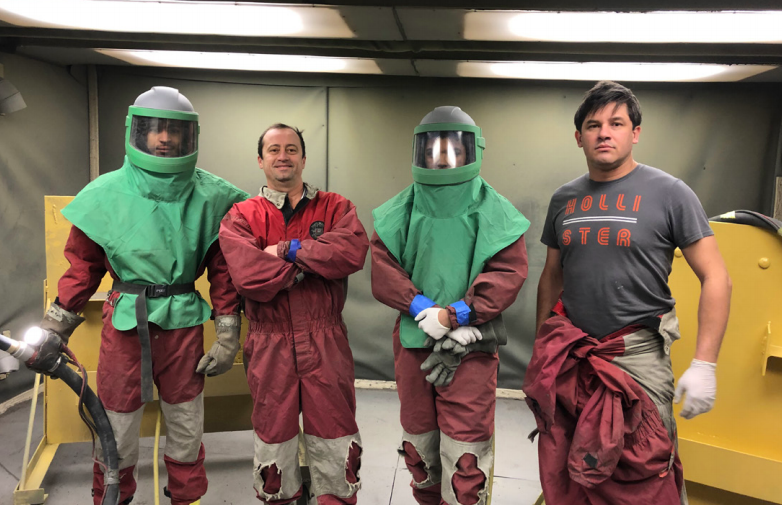 Industrial Painting apprentices perfecting their abrasive blasting L-R Bruno Montiero, Andre Fernandes, Darnel Santana & Rodrigo Costa. 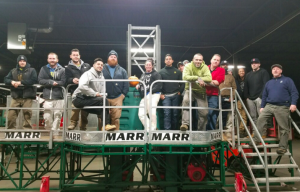 3rd year Painters and Tapers completing 32 hour scaffold with the help of Marr scaffolding on the Mast Climber. 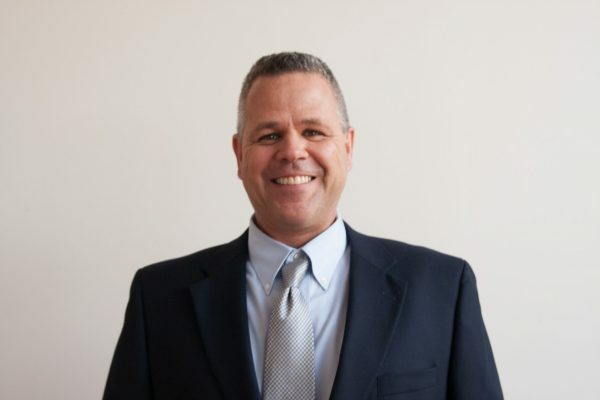 Enter the “new era” of glazier training and welcome Sean Love to the position of Director of Glass & Glazing. 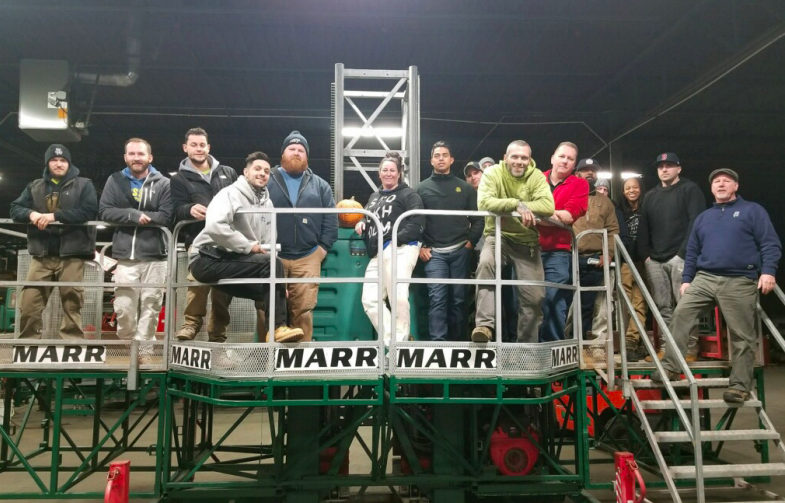 With almost 20 years under his belt, Sean is a graduate of the FTI New England Apprentice program and has already jumped in and hit the ground running. Sean is tasked with keeping the program on track and continuing the high-level training we’ve become accustomed to; his first change will be the newly created Glazier Certification. SSPC C5 Instructor Greg Internacole from DC 4 conducts a C5 for DC 35 members in New Bedford office. 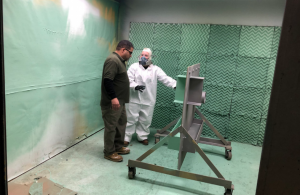 2nd year Apprentice Amanda Rivera demonstrating her skills for SSPC CAS exam proctor from DC 9 Angel Diaz. 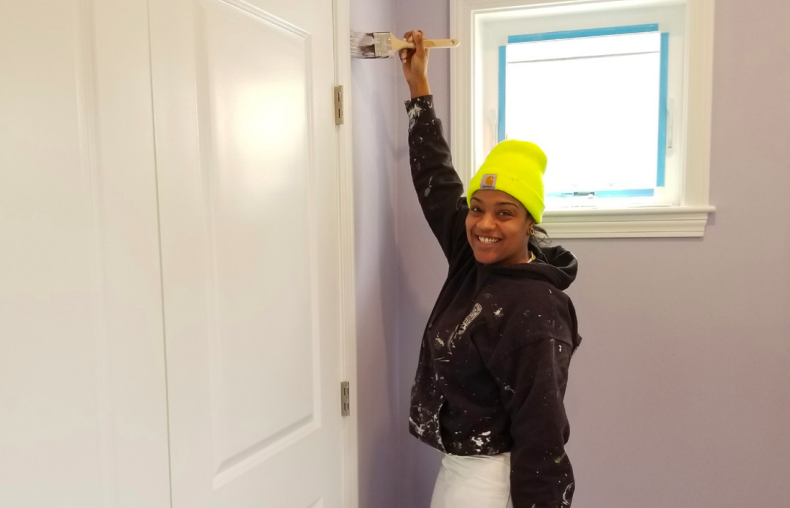 2nd yr apprentice Jacqueline Ramos putting the finish paint of the new home for a wounded warrior. 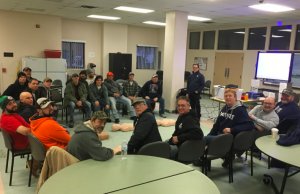 Director of Health & Safety Mike Moreschi delivers CPR / AED to DC 35 members in Northampton MA. The 1st year students of our Ayer Ma facility under the watchful eye of instructor Tim Yost (not pictured) have carefully refinished a set of 40 year old chairs that are proudly displayed in the Boston office. 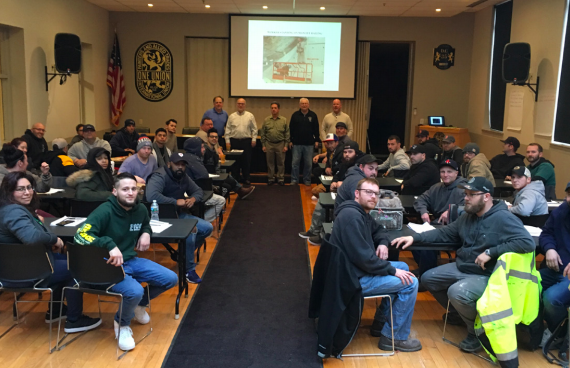 All 3rd year Commercial painter, Glazier and Taper apprentices come together for their OSHA 30 course. 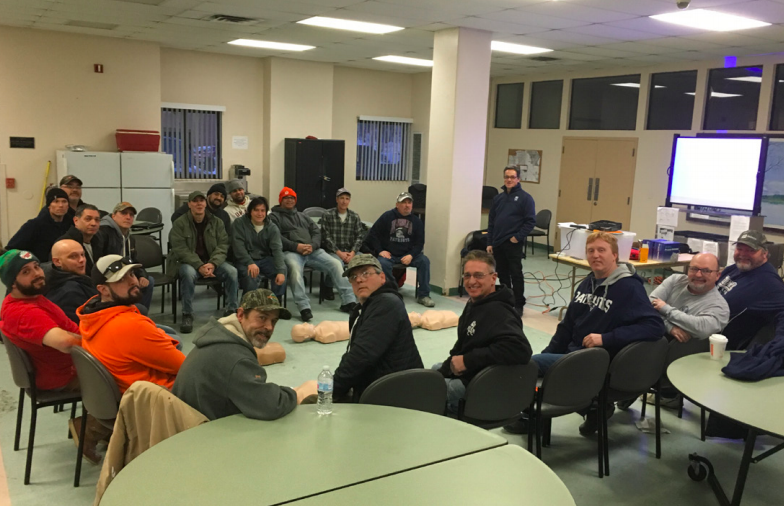 Featured instructors are L-R Stephen Gerbutavich, Tom Falter, Mike Moreschi, Russ Detore and Jim Sullivan. 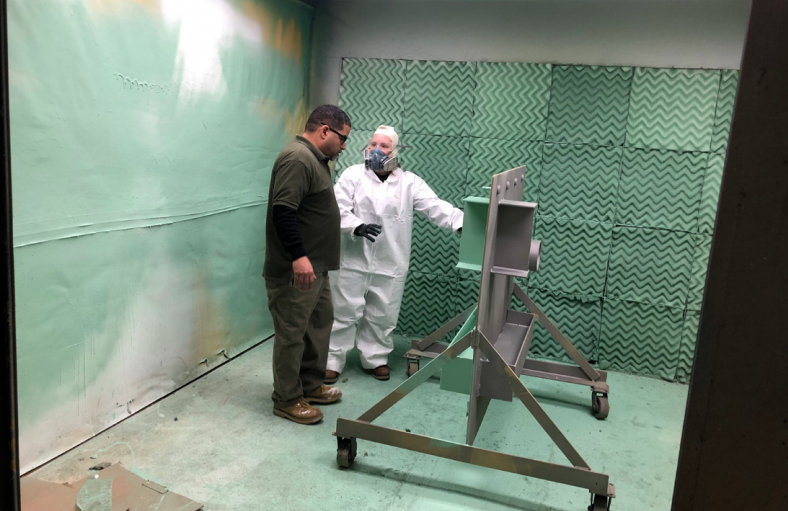 Because products, systems, and procedures are ever-changing, in order to maintain certification through the AGMT Certification Program, a certified technician must renew his/her certification every 4 years from the date of most recent certification. This process will require candidates to sit for a knowledge-based written test, plus provide evidence of a required number of glazing-related work hours during the preceding 4-year period, and completion of a prescribed amount of continuing education. Refer to the AGMT Candidate Handbook for specific requirements. 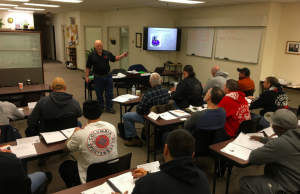 This new certification is very similar to the format we implemented with our industrial painters 10 years ago with the SSPC CAS certification which means as far as administering the program we have a leg up as to what to expect and maybe we can avoid some of the same pitfalls. We do have our work cut out for us but, I can assure you, this training department will do everything in our authority to achieve successful outcomes. So, welcome aboard Sean and let’s start training!